Any frequent reader of Much Ado About Fooding knows that I am not one to veer towards sweets. They rarely catch my fancy, and I especially do not flock to the hottest saccharine trend for the month. I am, however, open to the right ones to come around and change my mind, the ones that achieve a balance between flavor and cavity-inducers, the ones that highlight culinary aptitude. When I am able to close my eyes, take a bite out of any one of your sweet products, and immediately can distinguish what flavors are in each without my feeling a twinge of pain in my teeth from a high sugar content, you just might be onto something. Perhaps it is because you take great care in producing something you are proud of and from quality ingredients. 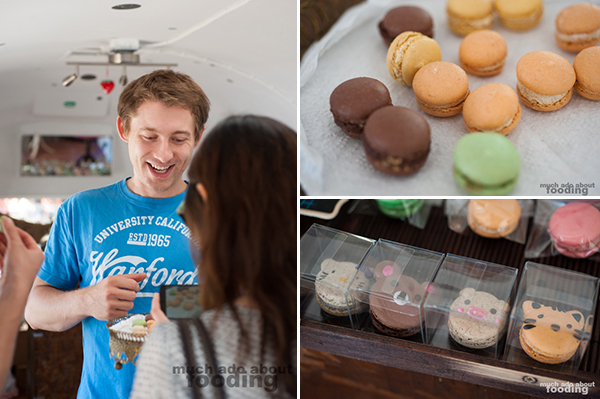 We discovered that when we came upon the Honey & Butter macarons in Costa Mesa. Each flavor can be identified because the ingredients are hand-ground, -jammed, -piped, etc with a focus on also sourcing locally. How can we say no to that? We got a chance to meet with the owners and chat with them about what brought them into the world of delicate French treats. 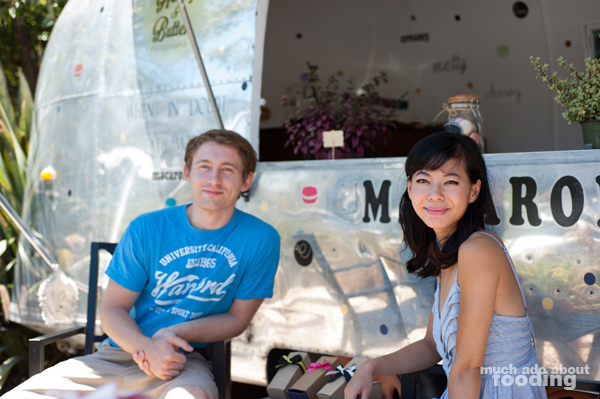 It might be a tad difficult at first to spot the polka-dot Airstream trailer at The LAB in Costa Mesa where husband-and-wife duo Paweł and Leanne have set up shop but you'll be glad to find them (visible from the parking lot side). Previously a hub for a t-shirt company, the mini-metallic shop has character to it that has only been enhanced by Honey & Butter's touch. 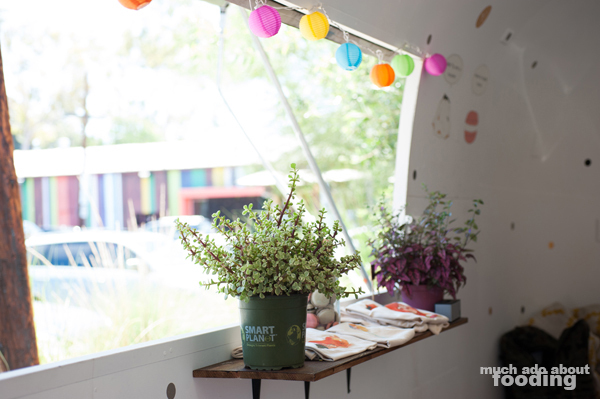 The design from decals to dots was all done by the duo themselves as they sought to make the space their own. 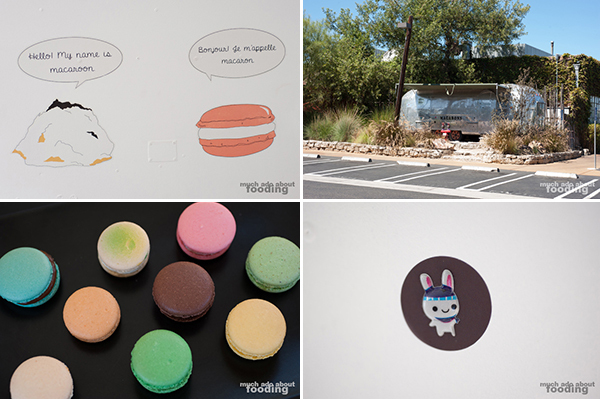 I really admired the educational visual near the main stand which differentiated between a macaron and macaroon; it's certainly a pet peeve of mine when I hear it pronounced incorrectly! Tell me about your origins. But the system and people that I had to deal with that made me realize it wouldn't make me happy; I needed to do something that will be fulfilling. We started this which was hard to do and keep up with in production BUT it's super fun. I don't mind late nights because I'm doing what I love." Aside from the direct sales they are making now, Honey & Butter has not given up the events side of where Leanne started. 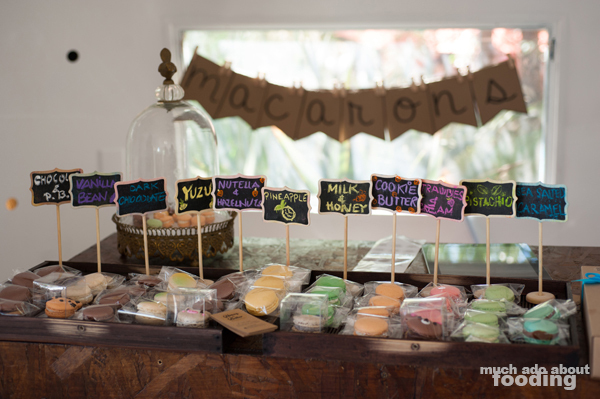 Her macarons are still able to be used for party favors for events; you may have had some during a wedding or baby shower even! To ensure the quality of their products, they make sure to hand-pipe and assemble the macarons themselves including all of the decorative event set-ups such as macaron towers. 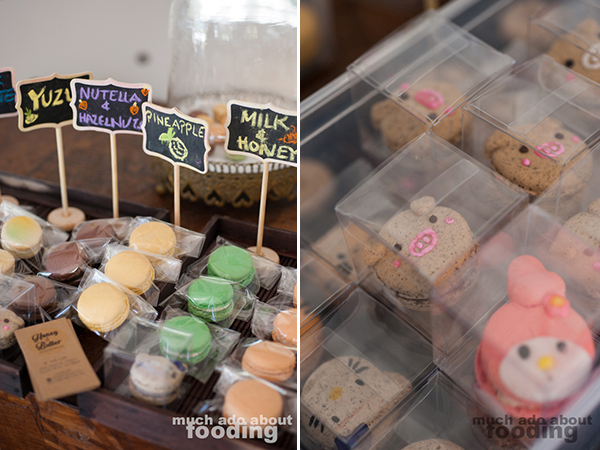 But the events do not interest me as much as their focus on sourcing good ingredients for their treats. I could not help but nod along when Leanne spoke of how she loves to experiment in her creation process, a trait I share when I get into the kitchen to cook. Popular flavors do stay on the rotation but the menu is constantly changing based on her creativity and customer requests; checking the website and Instagram account gives us the updates on what new is being flaunted. The most popular is pistachio and understandably so because Honey & Butter grinds their own pistachios before working with them instead of using the typical paste other producers do. 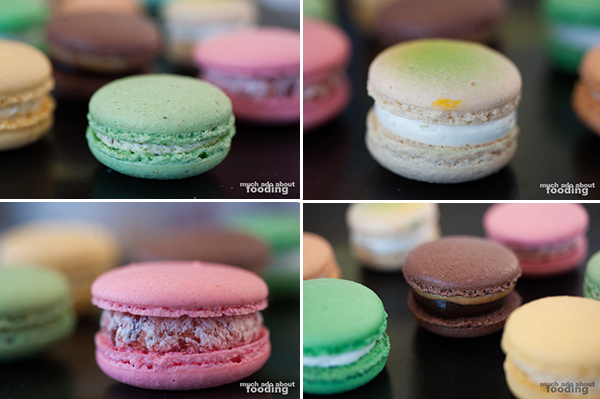 During our interview, we sample the gamut and are able to fill ourselves up with sea salt caramel, pistachio, milk & honey, vanilla bean, yuzu, cookie butter, pineapple, strawberry, and chocolate peanut butter macarons. Any chocolate used is Callibaut, the caramel is made from scratch, the vanilla bean has actually vanilla beans, the cookie butter flavor has actual crushed cookies, and all of the fruit flavors have fleshy pieces of their namesakes. How do you say no to that? Which ingredients are the most challenging? L: "Caramel is a big hassle to pipe and is really messy. We experiment a lot and some don't' turn out so well but some are big hits. We once had pancetta and cream cheese that was popular. Chestnut didn't last so long because the nuts fermented somehow! S'mores was fun but the layers of graham crackers, toasted marshmallows, and chocolate were difficult. I had a lychee one which was hard to get the flavor out. We also had banana that everyone liked. I'm working on taro but because I use real taro which has a lot of moisture, it gets soggy quick." When prompted about a favorite macaron to make, Leanne immediately pointed out pineapple but only because it is her personal favorite flavor. In terms of customers, the sea salt caramel racks in a lot of buyers because of their thoughtful sprinkle of fleur de sel per piece. In addition to unique flavors done well, Honey & Butter also has fun with their macaron shapes, creating "creatures" that can be specially purchased for a higher price or acquired through their promotion - buying 10 macarons will yield you a "pet" in its own personal "cage." There were pigs, cats, bunnies, bears, and even tigers (see below) that were just too cute to eat! Have you made any weird flavors? L: "Durian! I don't have it here because the smell is so pungent. I don't mind it myself but I know a lot of people can't stand it like Paweł. I used to deliver to a teahouse that wanted durian but every time they opened the box, it would smell! If you want durian, I'll make a special order but I can't keep it here. Also, I love the egg yolks in a moon cake so ground them up once into the buttercream to make a sweet and salty one. They were really good, and we had a customer bought everything we had. She came back the next day and bought everything again!" Though the macaron craze seems to have been largely female-driven throughout the trend, Leanne pointed out that their own customer base is broken up into all types of people. Anyone who seems to like sweets or macarons eventually finds him/herself laden with the goodies (though men prefer the nuttier, savory flavors). Because Honey & Butter is able to reach such a varied demographic, it is also able to educate the community more about the dessert. For starters, the shelf life of a macaron is 3-5 days depending on where you store it but the recommendation is in the refrigerator. Chocolate-based ones are more stable than buttercream-heavy flavors. 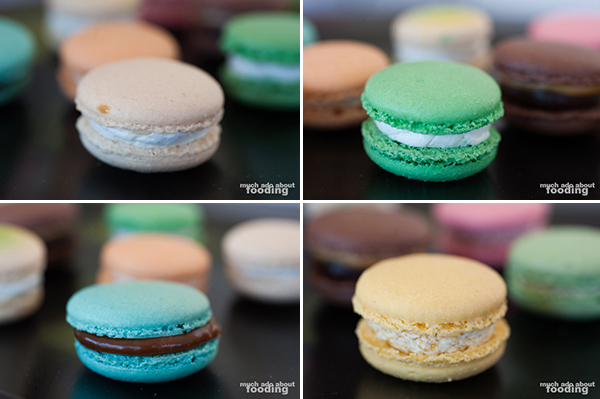 What's the best way to enjoy a macaron? L: "Most people think that macarons are better fresh but they're actually better one day aged since it gives the buttercream a chance to infuse flavors and merge with the shell. Here's a prime example: we had a flavor called Citrus and Tea that didn't work out so well the first day but after a few days, we tasted again for quality checking and it was a crazy experience. It was perfect!" P: "It was the best citrus type of macaron I've had. We even took photographs with it because we were so happy with it." I've never made macarons myself but our interview led to some method talk on how they achieve the greatness they do with each flavor such as charring sugar and cream together instead of one before the other. 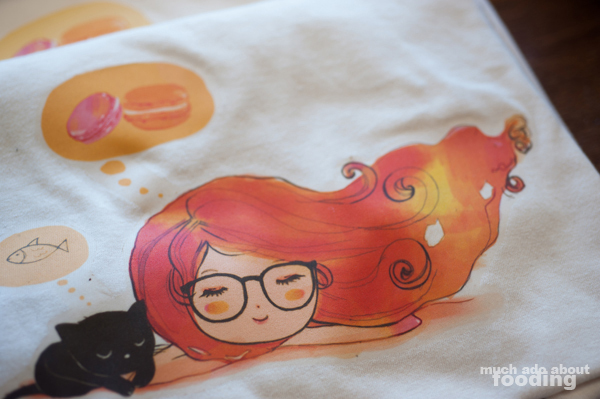 We saw Leanne become more and more vivacious as she talked about macarons and her own experimenting. Not only is she skilled with the baked goods but she is also the accomplished artist from the look of the Airstream. 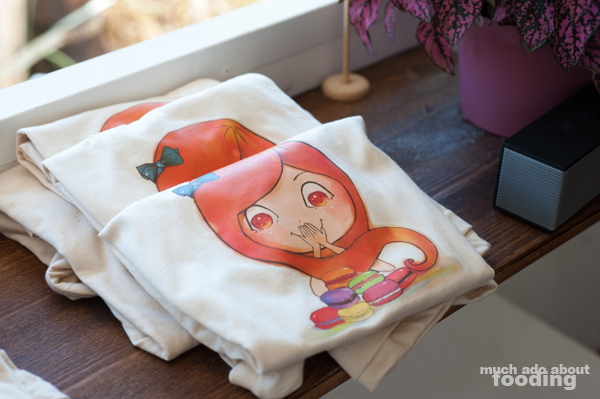 The gentle and artsy t-shirts near the window are all prints of her own illustrations and eventually there will be her own oil paintings in the space. Though only a few months young, Honey & Butter has already captured the hearts of many regulars and I'd attribute a large part of that to the visible passion that Leanne has for her creations. P: "The first time I tasted the Earl Grey, I basically jumped out of my shoes. It was the perfect flavor." One of the unique aspects of their business is the ability for passersby to get a sample of their product. Odd - how could one try a macaron without being financially detrimental to a small, new business? Baby macarons! If there is one thing you can be sure of in enticing people to come closer, it is miniature stuff. 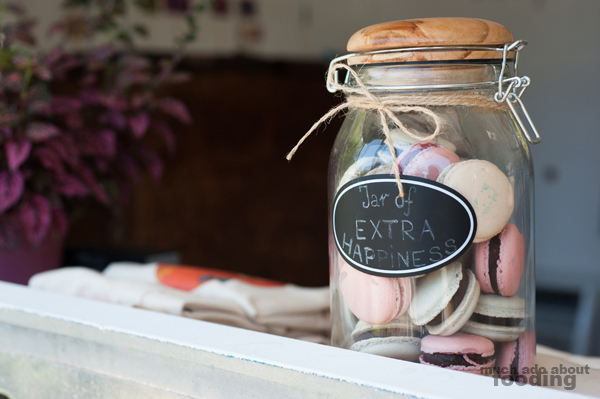 Potential customers who venture into the cozy space usually pop a tiny macaron into their mouths before submitting to buying a few flavors that interested them. For those who seek jelly fillings, Leanne is working on those but you will find buttercream for the time being. We admired how open and willing the two were to the suggestions and recommendations of their customers as they grow their business. When a customer claimed that the shells on the macarons she purchased were crunchy, the owners did not stubbornly chastise the customer for not understanding the product nor did they bawl and feel like failures. Instead, they studied the culprit products and made sure to fix the formula so that crunchy shells would not occur again; working with the recipe until a better consistency was yielded was the course of action. I'd dare say that they have found the perfect style now - the shells have a give with each bite that allow them to be slightly crunchy at the outermost part but then chewy inside. They even break carefully down on the filling without any leaking out the sides as the smashed shells seal in the innards. It is certainly a well-crafted confection. L: "I'm not in the business for money. I'm in this business to see the joy in people getting the stuff I make. it's so satisfying to see someone bite into a macaron and go, 'MMM!'" As a fledging food business in the rapidly expanding Orange County scene, Honey & Butter has really embraced the cultural culinary shift we have seen where products are made with care in both skill and ingredients. We are excited to see how quickly they will grow and what all they were continue to achieve as the months roll on. Looking forward, Leanne excitedly shared with us a few of her plans for the holiday seasons including gingerbread macarons, Halloween toasted marshmallow ghosts, spiced pumpkin pumpkins, and even a classy giftable "cosmic" black macaron adorned with edible gold leaf. We have no doubt that people will clamor for these and perhaps, the couple's dream for an eventual ground unit space will come true. For now, they are producing their fare out of The HOOD Kitchen Space but hope to build themselves into a shop that offers drinks, a wider selection of flavors, and other types of sweets such as cookies and madeleines. If this happens, you'll know where to find me during high tea! 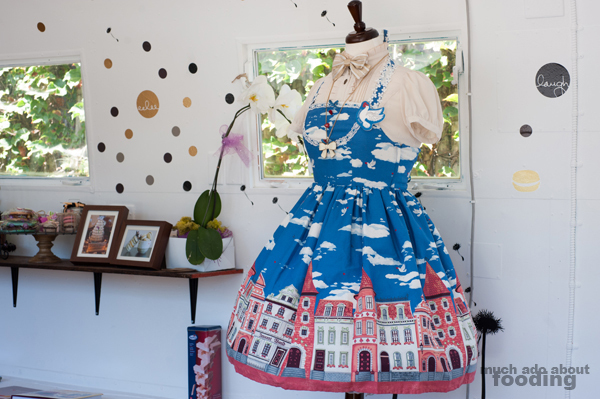 Costa Mesa, CA 92626), online at honeynbutter.com, and on Instagram at @honeyandbutter. I don't see how you could even be disappointed!